The Canon EF 100mm f/2.8 USM Macro Lens is an excellent macro lens - and may be Canon's most fun per dollar lens. This is the lens I most frequently recommend for someone starting out in macro photography – at least most frequently recommend until the Canon EF 100mm f/2.8L IS USM Macro Lens was introduced. The 100 macro is a medium-small lens and is rather light in weight. This is a very comfortable-to-carry-and-use lens. Build quality is decent but not as solid as Canon's L Series lenses. Utilizing USM (Ultrasonic Motor), the Canon 100 Macro internally focuses very fast, quietly and very accurately. I've been questioned on the fast AF statement several times since writing this review. I've rechecked my lens and, though it takes a little time to go from 1:1 macro to infinity, it focuses very fast at normal focusing distances. The second person to question this exchanged their lens for another - the replacement was much faster than the original lens they received. This would indicate to me that there may be an issue with some samples of the Canon EF 100mm f/2.8 USM Macro Lens. Another site visitor emailed me - they were ecstatic that a firmware upgrade to their Canon EOS-1D Mark III DSLR resolved their 100mm Macro focusing speed issue. Also note that there is a discontinued non-USM version of this lens. Keep these datapoints in mind if you run into a slow version of this lens. When focusing at 1x subject distances, it is very nice to have a lens that does not extend. FTM (Full Time Manual) focusing is enabled and the front element does not rotate. A focus limiter switch enables full or restricted focus distances. The MF ring is nicely sized, well-damped and smooth. 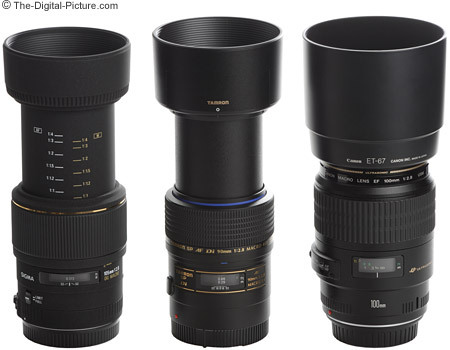 Above, from left to right, are the Sigma 105mm f/2.8 EX DG Macro Lens, Tamron 90mm f/2.8 Di Macro Lens, Canon EF 100mm f/2.8 USM Macro Lens and Canon EF 24-70mm f/2.8L USM Lens (for size comparison). The same lenses (sans Canon 24-70 L) are shown fully extended (1:1 macro focusing distance) below. Most macro lenses are sharp, and the Canon EF 100mm f/2.8 USM Macro Lens does not disappoint in this area. This lens is sharp wide open and even sharper stopped down slightly with corners showing the most improvement. The tiniest details in your tiniest subjects will come to life with this lens. Vignetting is apparent at f/2.8, but rapidly disappears when stopped down. Flare is very well controlled. Color and contrast are excellent. Distortion is negligible. Eight aperture blades help to create an excellent quality background blur. There are other (non-macro lens) solutions for macro photography such as extension tubes and close-up filters/lenses (such as the Canon 500D Close-Up Lens), but these solutions require adding/removing lenses or filters to take a lens from macro mode to normal mode and vice versa. I find true macro lenses (1:1) such as the 100 macro to be more convenient to use. The advantage alternate solutions have is usually their affordability. Like all of the other photo gear decisions that must be made, this decision is your personal choice. As it is a true 1:1 macro lens, the Canon EF 100mm f/2.8 USM Macro Lens will deliver a subject to your sensor at the same size it is in real life. 1x magnification is achieved at the MFD (Minimum Focus Distance) of 1' (.3m). It doesn't take a very big subject to completely fill the frame at this 1x magnification. The Canon 100mm macro allows a reasonable minimum working distance (MWD) of 6" (150mm) from the end of the lens (without the hood in place). Going further, extension tubes can take the magnification to 1.19x and 1.39x for 12mm and 25mm tubes respectively - at the expense of lost infinity focus. Canon's extenders are not compatible with this lens. 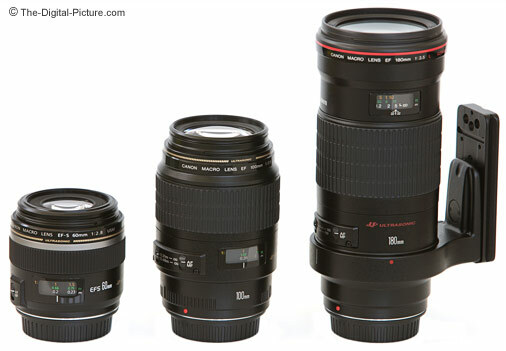 Pictured above from left to right are the Canon EF-S 60mm f/2.8 Macro USM lens, Canon EF 100mm f/2.8 Macro USM lens and Canon EF 180mm f/3.5L USM lens. 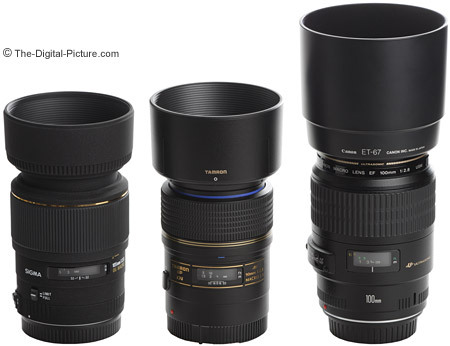 With their hoods in place, from left to right, are the Sigma 105mm f/2.8 EX DG Macro Lens, Tamron 90mm f/2.8 Di Macro Lens and Canon EF 100mm f/2.8 USM Macro Lens. As is obvious below, these macro lenses are much more similar in size when extended 100% at their shortest focus distance. The 100 macro's ET-67 Lens Hood is an optional accessory as is a lens pouch for storage. The Lowepro Lens Case 2 (tight) and 3 (loose) are good options while Canon suggests their LP1219 soft pouch. Another optional accessory for this lens is the Canon Tripod Mount Ring B(B). Tripod rings/collars make tripod and flash bracket use much better experiences. A 58mm filter size makes buying filters for this lens affordable. Choosing the right focal length is probably the first criteria. Longer focal length macro lenses generally give you more distance-to-subject working space for the same subject framing. At the Canon EF-S 60mm f/2.8 Macro lens' 3.5" or so (9cm) 1:1 working distance, it is hard to keep from scaring insects out of the territory. The Canon EF 100mm f/2.8 USM Macro Lens allows about 6" (15cm) and the Canon EF 180mm f/3.5L USM lens allows about 9.5" (24cm) of working distance at 1:1 magnification. More working distance is usually better for my typical macro work. The pictures above were taken with three macro lenses (180mm L, 100mm and 60mm). They are identically framed using the same aperture setting (f/16) and have identical subject to background distances. DOF (Depth of Field) is not different (same framing, same aperture = same DOF until closer to the hyper-focal distance), but perspective/compression and angle of view are very different. 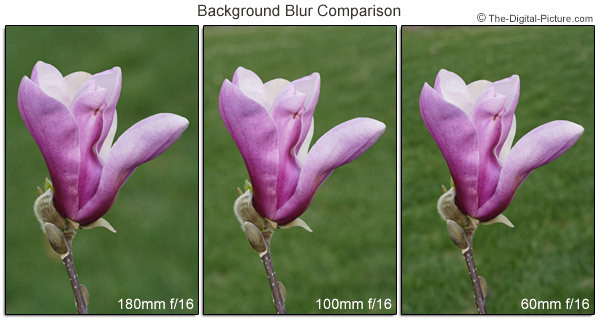 The 180mm lens shows only a small physical area of background subject that is compressed/enlarged to magnify the blur. Background subjects in the 60mm picture appear to be more in focus. They are not - they are just about as blurred, but they appear much smaller in the picture - and there are more of them because of the 60mm's angle of view. This yields a less diffusely-blurred background. If you are using a backdrop (such as rolled paper), the background blur aspect will probably not be important to you. There are downsides to the longer focal length macro lenses. They are larger/heavier and require a faster shutter speed for handholding. They also cost more. If you are looking for the ultimate nature macro shots, there is probably not a better choice than the Canon EF 180mm f/3.5L USM lens. But, this is a relatively heavy and expensive lens that focuses slowly. Another good option is the Sigma 150mm f/2.8 EX DG HSM Macro Lens. It does not focus as quickly or as accurately, weighs more, has more vignetting and costs more. Well, costs more until the optional lens hood and tripod ring are added to the Canon 100. The 150's advantage is the longer focal length and working distance. 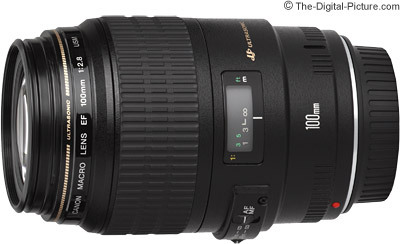 If you are looking for a great macro lens, the Canon EF 100mm f/2.8 USM Macro Lens is a very good choice. It offers excellent optical performance and middle of the road focal length, working distance and size/weight. Price makes this lens a great value. The 100mm focal length along with great bokeh (foreground/background blur quality) makes this a great portrait lens as well. Here is a warning for anyone contemplating the purchase of the Canon EF 100mm f/2.8 USM Macro Lens: You will find yourself looking for little things to use for subjects - which are everywhere. No bug is safe. You will find your neck hurting from looking down all the time. You will discover a world you never knew existed. Macro photography is great fun. And men - You now have another reason to buy your wife flowers (they make great subjects). 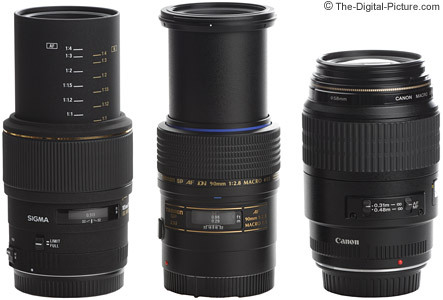 Should I Get the Canon EF 100mm f/2.8L Macro IS USM or the EF 100mm f/2.8 Macro USM Lens?